May 18, 2015 – NASA and the National Additive Manufacturing Innovation Institute, known as America Makes, are holding a new $2.25 million competition to design and build a 3-D printed habitat for deep space exploration, including the agency’s journey to Mars. 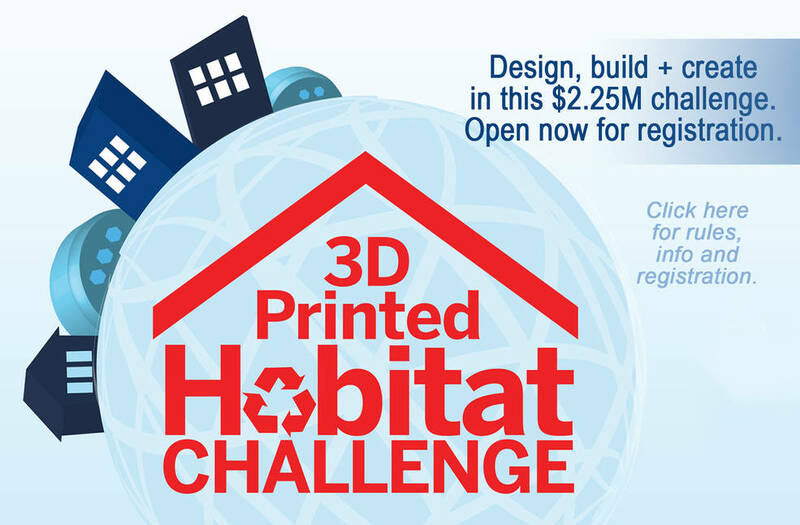 The multi-phase 3-D Printed Habitat Challenge, part of NASA’s Centennial Challenges program, is designed to advance the additive construction technology needed to create sustainable housing solutions for Earth and beyond. Shelter is among the most basic and crucial human needs, but packing enough materials and equipment to build a habitat on a distant planet would take up valuable cargo space that could be used for other life-sustaining provisions. The ability to manufacture a habitat using indigenous materials, combined with material that would otherwise be waste from the spacecraft, would be invaluable. The first phase of the competition, announced Saturday at the Bay Area Maker Faire in San Mateo, California, runs through September 27. This phase, a design competition, calls on participants to develop state-of-the-art architectural concepts that take advantage of the unique capabilities 3-D printing offers. The top 30 submissions will be judged and a prize purse of $50,000 will be awarded at the 2015 World Maker Faire in New York. The second phase of the competition is divided into two levels. The Structural Member Competition (Level 1) focuses on the fabrication technologies needed to manufacture structural components from a combination of indigenous materials and recyclables, or indigenous materials alone. The On-Site Habitat Competition (Level 2) challenges competitors to fabricate full-scale habitats using indigenous materials or indigenous materials combined with recyclables. Both levels open for registration September 26, and each carries a $1.1 million prize. Winning concepts and products will help NASA build the technical expertise to send habitat-manufacturing machines to distant destinations, such as Mars, to build shelters for the human explorers who follow. On Earth, these capabilities may be used one day to construct affordable housing in remote locations with limited access to conventional building materials. America Makes is a public/private partnership of organizations focused on accelerating the capabilities and adoption of additive manufacturing technology. The Centennial Challenges Program is managed at NASA’s Marshall Space Flight Center in Huntsville, Alabama for the agency’s Space Technology Mission Directorate in Washington.